3. 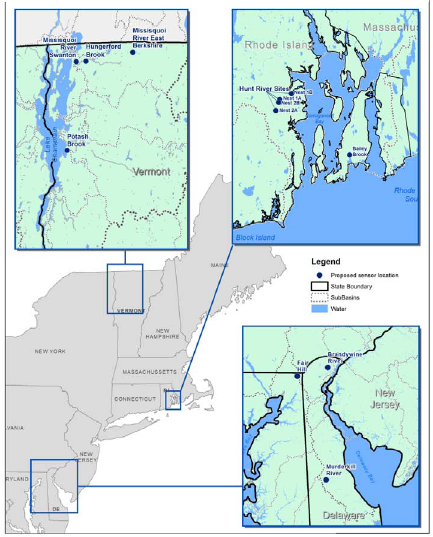 Local and regional differences of study watersheds (VT-RI-DE) in land use, topography, geology, geomorphology and ecology, when coupled with high-frequency nested water data, will allow us to determine how individual watershed features amplify or dampen the hydrologic and water quality responses (magnitude, intensity, and duration) to weather and climate variability. The NEWRnet Social-Ecological Gaming and Simulation (SEGS) Lab is a transdisciplinary research lab focused on modeling and simulating Social-Ecological Systems (SESs) from a complex systems perspective by drawing on a range of data sources from simple metadata to "big data" and thick description. A unique feature of the SEGS lab is its focus on the design and implementation of a variety of experimental games and computational models. The SEGS lab team aims at forging new partnerships at state, national and international scales with scholars and practitioners working in this fast-growing and emergent area of research and practice at the nexus of social and behavioral sciences, and ecology.